The Church in Holtville. Elder Arvell Charles, the church's pastor, preaches on second and fourth Sundays of each month. He has faithfully worked to get good sound visiting elders for the other Sundays. 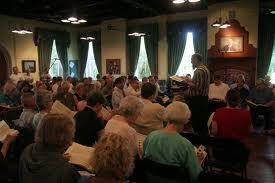 When the church has no visiting elder on those Sundays, they meet, sing, pray, and listen to recorded sermons. Thank the Lord for their faithful zeal. And thank the Lord for Brother Arvell's labors; pray for the Lord's rich blessings on him and the church. Also pray for the New Bethel Church, also served by Elder Arvell. Precious saints. April 26-28, Lindsay Church's annual meeting. Dinner will be served on Friday evening, April 26 at 5:00 P. M. An evening service will follow. Three services, morning, afternoon, and evening, are scheduled for Saturday, with the meeting ending with the Sunday morning service. If you have any questions, please call at (559) 618-2575. Saturday, May 4, Golden Gate Church Singing. Singing will start at 10AM. We will break for lunch around noontime and gather after lunch to sing until around 3:00. Golden Gate Primitive Baptist Church would like to announce our annual 2019 meeting to be held the 4th weekend in June. The meeting will begin Friday morning, June 21st at 10:00 A. M. and conclude with Sunday morning services on June 23rd. We will have three services on Friday and Saturday at 10:00 A. M., 2:00 P. M., and 6:30 P.M. Elder Luke Addison from Mt. Gilead Primitive Baptist Church in Smithdale, Mississippi has agreed to be with us. We would love to see all of you there and join with you in worship unto our Lord and Savior. If you are unable to attend, we ask that you please unite with us in prayer for our meeting. Lunch and dinner willb e served at the church and we would love to accommodate as many as we can in our homes. There are also RV hookups for water and electricity on the church grounds as well as hotels in the area. July 5-7, Santa Paula Church's annual meeting. July 26-28, Harmony Church (Hughson) annual meeting. September 27-29, Glorious Kingdom Church's annual meeting. November 1-3, Madera Church's annual meeting.